Well I guessed wrong. Easter Sunday may be a holy day, but to the Spanish it's just another day to eat drink and be merry. We turned in at about 23:00 in anticipation of having a quieter night, at least after midnight, the beginning of Sunday. But no, the noise continued. I got up and put cotton wool in my ears but that didn't help much at all. By 01:30 I'd had enough and announced to The Chef that we were moving down to the beach car park we'd seen on Friday whilst out wandering. We quickly made the vehicle ready enough to be driven for a short journey, and The Chef went and paid the car park attendant €12 for our two nights stay. The theory was that the beach car park would be easy to find because it was at the mouth of the river next to which we'd been parked. Off we went, deciding to swing a bit wide in the town to miss all of the drunken revellers in the funfair, market and bar area on the opposite side of the river. Having done that we got caught up in the towns one way system, and it was dark, and we found ourselves in one-way, very narrow back streets with cobbled surfaces and blind crossroads within them. Having had a lovely tour of the town, being so near yet so far we finished up back in the area where all the noise was coming from earlier. All was quiet, with lots of kids making their way home. By now it was about 02:00, and we guessed that was the time they packed up, and due to our lack of success in finding the beach decided to make our way back to our original car park area for the rest of the night. Settled back in, we thought our second night of grief was at an end, but no, shortly afterwards the music started up again with that dreadful rhythmic boom, boom, booming of the base sound always there. We had to conclude that the noise was coming from a bar or club across the water as everywhere else had packed up. I had to just put my head under the pillow and endure it. Yet again the finishing time was about 04:00. The alarm went off at 08:00 and I put the boiler on for a nice hot shower. My word that was a long night. Scrubbed up and fed we made our way to the nearby railway station where we bought two return tickets to Cadiz. It was to be a 35 minute journey in a horseshoe shape around the bay. Just after setting off I noticed that on the other side of the highway from where we were parked was a large area of what I would describe as swampland, and within it, man-made oblong lagoons had been created - they were farming salt. The tide comes in, fills the lagoons, they dam them, then allow them to dry out through evaporation before removing the salt which lies there. Lots of stagnant water, little wonder mosquitoes have been taking lumps out of me during the night. On arrival at Cadiz I was impressed by the design of their new station. It was very boxy and functional, so much so, you could put a cleaner up on a raised platform and clean the much lower than usual ceiling. 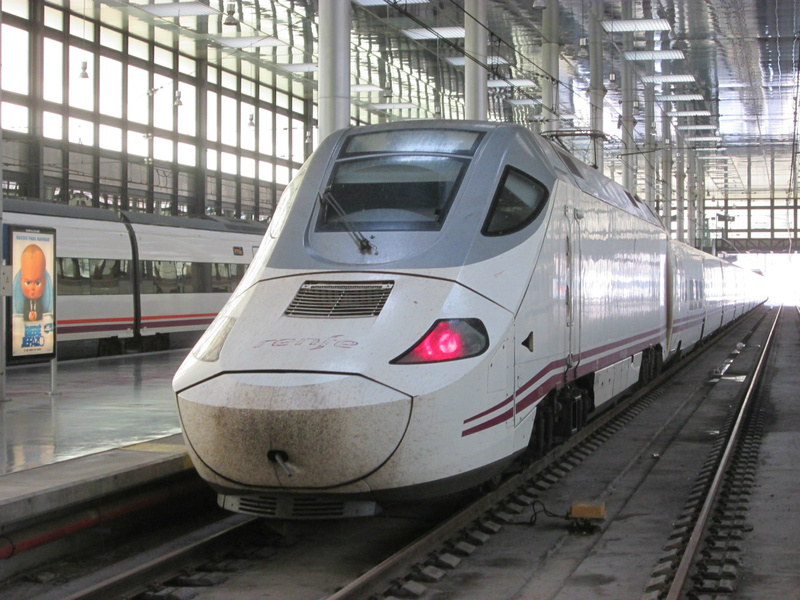 There were a number of trains sat in the station, including a high speed model, as Cadiz was the end of the line. For some routes the other end is Barcelona, now that's what you call a train trip. First we passed the port area, which has changed beyond all recognition from the days when sailors set off from here to trade with America. It was about 10:30 and people were already filling up the cafés and bars. I wondered what percentage of the average Spanish income gets spent in bars, cafés and restaurants. No matter what time of day it is, lots and lots of them are busy doing nothing. We soon realised that the Jerez tourists map we used yesterday had a scale for measuring 300 metres, today in Cadiz, that same distance was for only 200 metres, clearly Cadiz was not going to be as big. We soon came across the cathedral, a magnificent building and one of the largest cathedrals in Spain. Fortunately I managed to get a couple of pictures of it and a few other buildings before the pocket camera packed up - flat battery. It was my spare battery as well, the other one is awaiting charging, so now that's two flat batteries I have. It's very annoying as this camera has a nice wide angle lens on it, and so often I can get the subject to fit in the viewfinder of this one when the SLR just can't manage it. We turned the corner on to the promenade in the direction of the Roman Theatre. It wasn't far away, what there was of it. It was free entry and there were a few people in there, but despite wandering around the outside of it we could see no way in. Never mind, I managed to get a picture from the road, and I didn't feel I'd missed out on some architectural wonder of the world. Back now in the opposite direction along the promenade where we soon came across the first of two forts. It was then that we realised the scale of the map, it wasn't going to take us too long to do Cadiz. Both forts were very disappointing. We decided it was time to turn right and in to the Old City, where there were lots of narrow back streets, and amazingly numerous businesses were open. I assume many of them were taking advantage of the weekends tourist trade. This area is renowned for its 'Fish & Chips', however they were quite unlike what we get back home. Here they are more like scraps of anything that swims in the sea which is then fried in batter and served with chips. If you are someone who enjoys just about any kind of seafood then such a meal would be a delight I'm sure. Eventually we came across the Central Market, which either had remnants of a Roman structure included in it or was another Spanish restoration. Close by there was a car boot sale, but without the cars. It seems the Spanish like there junk just as much as we Brits. There were numerous bars and restaurants surrounding the area and we were drawn to a small permanent kiosk where we bought chicken with stuffing in a bread roll plus a portion of chips, all for €6.50, pretty good value for a tourist haunt. Next we tracked down the nearby Torre Tavira, the city's official watchtower in the 18th century. It looked like a square lighthouse with a number of narrow staircases to get up. Given that it was a public holiday it was busy and there seemed no point in subjecting ourselves to the grief of trying to get up there along with everybody else. Besides which it wasn't much taller than the surrounding, more modern buildings. Soon afterwards we concluded that we'd seen everything we had highlighted on our tourist map before arriving, and so made our way back to the cathedral area where we sat and had a nice large, cold beer each whilst people-watching. Then it was back to the train station. Unfortunately Cadiz hadn't taken nearly as long to look around as we thought. The train back was nearly empty and we were soon on familiar territory. After getting straight I put one of the camera batteries on charge, drawing power from the vehicles battery through a small inverter. Then it was a lie on the bed for both of us. It was so very hot and we were very tired from having had two nights of very few hours sleep. Once we were up we prepared the vehicle for another short journey. Our second attempt to find the beach car park. Having been on Google Maps I could see that it was only a short distance from the town's only campsite Camping Playa Las Dunas www.lasdunascamping.com so with the co-ordinates of the campsite fed in to the satnav and the benefit of daylight we set off. Needless to say we found it first time and so much quicker. We intend to spend a fere night camping here in the hope that it is quieter than the car park down by the river, though with Spaniards around there is no knowing, it could be even worse. We will be so glad to see the back of this long Spanish Easter holiday period, we knew it would be a pain to us and it has been. Tomorrow I'm going to go up the road to the campsite and see how busy it is with a view to us spending perhaps a couple of nights there before setting off for Seville.